3 M English focuses on developing strong reading and writing skills as well as improving your oral English (listening and speaking) in addition to mastering grammar and vocabulary at an upper intermediate level. Reading is challenging and will serve to develop your understanding of British and American literature and culture, as well as to strengthen your comprehension, analysis, and interpretation. This year will focus on essay writing. Literary topics and issues will enable you to write essays in which you will show your analytical skills. 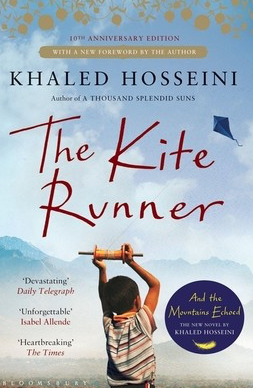 We will start with The Kite Runner1, (2003) a novel by Afghan born American author Khaled Hosseini The unforgettable, heartbreaking story of the unlikely friendship between a wealthy boy and the son of his father’s servant, is a beautifully crafted novel set in a country that is in the process of being destroyed. It is about the power of reading, the price of betrayal, and the possibility of redemption; and an exploration of the power of fathers over sons—their love, their sacrifices, their lies. We will go on with Shakespeare's Romeo and Juliet2 : as an introduction, we will study Shakespeare's life thanks to the film Shakespeare in Love and get familiar with his language. The tragedy of Romeo and Juliet will allow you to practice close text analysis and spot figures of speech by the scores. Acting out some scenes will guarantee us more than our share of fun in class. The edition chosen, No Fear Shakespeare, gives you the complete text of Romeo and Juliet on the left-hand page, side-by-side with an easy-to-understand translation on the right. We'll end up watching one among the numerous film adaptations of the Bard's masterpiece. Oral expression is worth a good deal of the exam, therefore a strong priority will be given to oral presentations to the class, grammar or vocabulary topic-based role-plays or other research work. We will spend most of our half-class periods analysing and commenting newspaper and magazine articles, as well as literary extracts, either individually, in pairs or in groups, debate-style when appropriate . These practice exercises will prepare you for your individual oral exam, which will last 15 minutes (10 minutes presentation, 5 minutes conversation with teacher/expert). You will be given 30 minutes preparation. You will deal with an unknown text, similar to the ones practised all year long, either a literary extract or a newspaper article, it's up to you, but you must make up your mind a few weeks before the exam. Your skills will be evaluated in all essays including passage analysis ( ~half grammar/half contents) as well as in the proficiency of your argumentative writing, which you will practice in relation with the main issues the novels deal with. Of course most routine assignments are also ways for you to master and improve your ability to compose insightful, articulate and quality texts. The written literary exam will consist of an essay based on topics chosen from the books we will have read by June 2016. You will be allowed to choose one topic out of two An average of 450-550 words is expected. Take every opportunity to express your writing skills during the regular assignments I give you in parallel with the reading work. Grammar-3 Remember "English Bugnon Grammar4U" for revisions! Your third year in high school will be mostly devoted to revisions, as we have already covered most of the grammar topics you should master for the -MCQ-word formation-sentence transformation - written grammar exam. If there's anything you don’t understand, don’t hesitate to ask questions, even elementary ones especially when revising ! I will always be ready to explain again. Your proficiency in English during the written as well as the oral activities will rely greatly on you mastering the words of the Bescherelle vocabulary book. On top of the final chapters to be covered (33-50), emphasis will be given on phrasal and irregular verbs - you can't do without them, so be prepared ! Expect quite a few listening exercises and tests , for instance from the BBC, during this school year as a listening comprehension will be included in your final exam. Your listening comprehension exam will take place in early June. Watching films like “Shakespeare in Love” which will introduce you to the Elizabethan era,, and Zeffirelli's Romeo and Juliet will challenge your listening and understanding skills. Mind you, the oral comprehension exam will be audio only. Reading Comprehension will be tested in your final exam, on one or two unknown texts (~2000 words) on social issues, or a literary extract . It is worth 40% of the written exam and is made up of True/False questions, titles to give, short answers to provide, a,s.o, similar to the ones done in class. Vocabulary tests will be grouped in a pack of 9 and their average multiplied by 2 will give you 2 full marks, each one equivalent to any other mark you will get in grammar, reading comprehension, ... . As you will have at least one more test than the 9 required ones, you will be allowed to leave out the worst mark at the end of the school year, provided you have attended all tests. If you miss one vocabulary test, every mark will count. If you miss more than one test, then you will have to redo it in class, provided your excuse has been accepted as valid. In addition to the vocabulary tests mentioned above, expect about 2 tests in each skill (use of English/Grammar, reading comprehension, writing, speaking and listening). Most of major documents or assignments are to be found on my personal website5 or on the English Department's6 for instance if you are looking for exams guidelines, a “séjour linguistique” , an exchange program for next year, a gap year in Australia or more general help (grammar exercises, on line listening activities …). Besides you always have the opportunity to contact me by e-maill7. Please be sure to come to class prepared (which means with exercises done and chapters read), with your notebooks, books, cell phones off and an open mind. If you find yourself in trouble, academically or otherwise, please come and see me sooner rather than later. Don't be afraid to ask for help. I will make time to see you one-on-one. I hope this year will bring you a most fulfilling time and lead you to successful exams!